This beautiful outdoor pendant is a wonderful addition to the exterior of any home. Features a hazelnut bronze finish and seeded glass. Charming fixture is made of durable powder-coated steel and is rated for damp location use. It is a good choice for a covered porch ceiling. The seeded glass globe makes it elegant enough for interior use also. The Belle collection reflects a vintage Early American design reminiscent of Williamsburg or New England. Indoor outdoor use. The Gama Sonic Baytown GS-106FPW-WB is a rust-resistant cast-aluminum solar outdoor light fixture with an attractive finial and a powder-coated weathered bronze finish. It comes with hardware for hanging the unit as an outdoor wall sconce, bolting it to flat surfaces, or fitting it on a three-inch-diameter lamp post (post not included). The Baytown's internal Lithium Ion battery pack charges when sunlight hits the fixture's four integrated monocrystalline silicon solar panels. The fixture is designed to provide 80 lumens of light from dusk to dawn when the battery gets fully charged by a day's worth of sunlight. You choose the LED colour tone with the flip of a switch: bright or warm. Extra benefits include Gama Sonic's patented light-enhancing cone reflector, panel protection with durable tempered glass, and a battery pack that should last for about 1,000 charges. For any product questions or unexpected issues, Gama Sonic support at our Atlanta headquarters is here to help. This traditional style ceiling flushmount will transform any room in your house in just minutes! The smooth holder and the sturdy frosted glass shade give this light a "vintage" look. It's ideal for your foyer, hall or bedroom. You can also use a dimmer to alter the light level to suit your mood. The Lithonia Lighting Outdoor Industrial Fluorescent Fixture is designed for low to medium mounting heights and is ideal for use in areas of dirt, dust, humidity and moisture. The fixture features a UV-stabilized, impact-resistant, clear prismatic polycarbonate lens in a fully gasketed housing. Outdoor Pendant Light Fixture with Seeded Glass in Hazelnut Bronze This beautiful outdoor pendant is a wonderful addition to the exterior of any home. Features a hazelnut bronze finish and seeded glass. 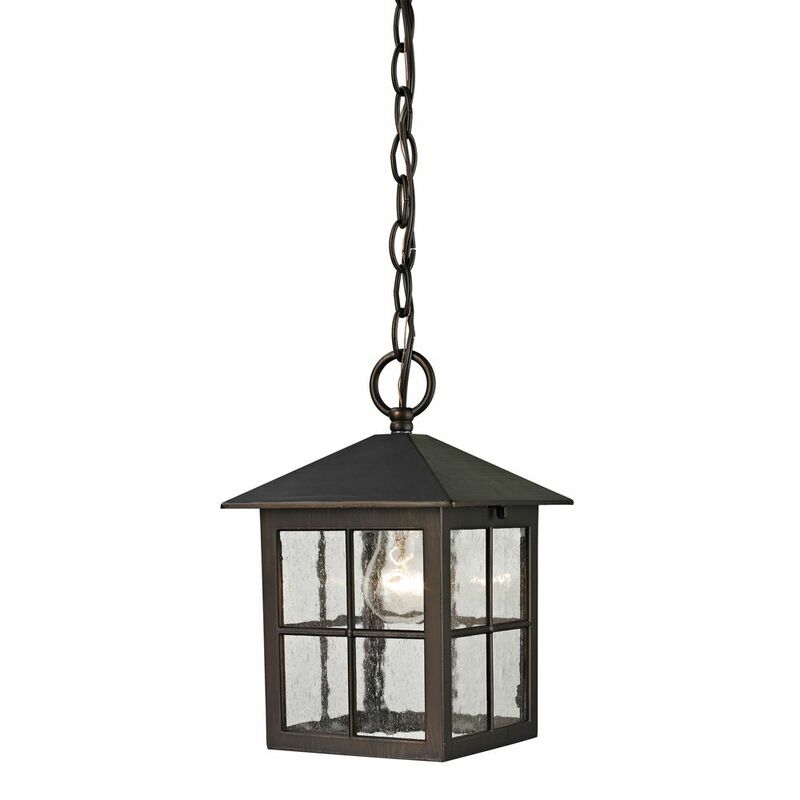 Outdoor Pendant Light Fixture with Seeded Glass in Hazelnut Bronze is rated 4.5 out of 5 by 4. Rated 4 out of 5 by Nan from Looks nice but smaller than expected.... Looks nice but smaller than expected. Rated 4 out of 5 by CMA from It was a bit of a hassle to adjust the... It was a bit of a hassle to adjust the chain, but the product is reasonably made and looks lovely. Rated 5 out of 5 by SS14 from This was a great match. I was very pleased to find such a great match to sconces installed 10years ago. The light is very welcoming, and reaches the ground. The hazel/bronze color is a great weathered look. The ordering on line is terrific, and no shipping charges to send to the home. Super way shop! I tell everyone how easy it is.